The notes of birdsong on the breeze. 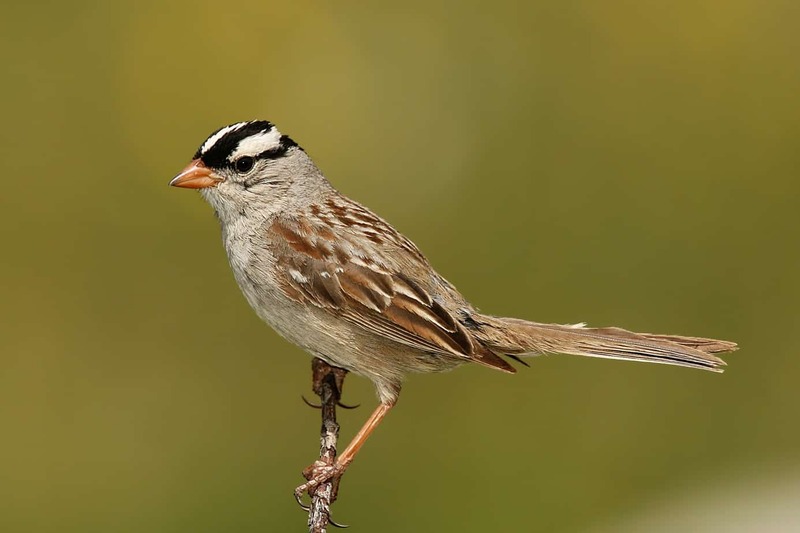 The White-crowned sparrow, one of the birds that was monitored in this study (Photo Credit: Wolfgang Wander). This is a Kyrielle, inspired by recent research which has found that machine learning can be used to better determine bird migration patterns, and the effects that climate change is having on them. It is thought that climate change will affect the migration patterns of many animals, including songbirds. However, monitoring these changes can be difficult; the migration patterns of songbirds can span many thousands of miles and their bodies are too small to tag with GPS receivers. By placing sound recording equipment in some of these known locations, researchers can monitor the amount of time the birds spent singing and calling each day and can then estimate when they have arrived en masse at these locations, i.e. the migration arrival date. Unfortunately, sifting through these archives of sound recordings takes a large amount of time and effort, and up until now has made the whole process extremely slow. In this new study, researchers have been able to train computer algorithms to search through large amounts of sound recordings taken in the Arctic and other remote sites, using machine learning to pick out birdsong from various other sounds, such as the wind, trucks, and other human activity. The arrival dates that were calculated via this approach agreed well with more traditional methods, demonstrating that avian migratory arrival can be detected autonomously. Using this approach, the researchers found that environmental conditions heavily influenced daily variation in songbird vocal activity, especially before egg laying. This machine learning approach could potentially be extended to any dataset of animal vocalizations, helping researchers to speed up their analyses and enabling them to better understand and forecast how climate change affects the migration patterns of other animals and birds.